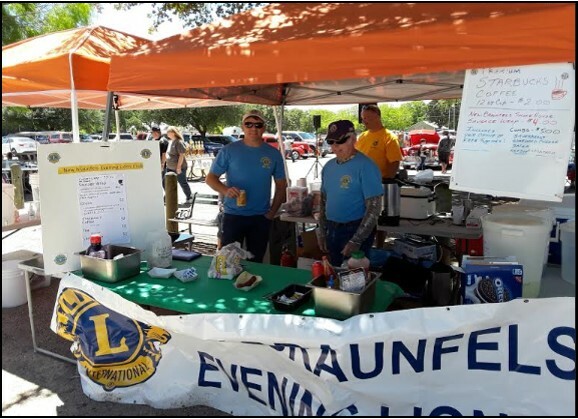 After a one year absence, our club was back in action at the New Braunfels Swap Meet that was held on the Comal County Fairgrounds. Vendors and buyers from all over the world were in attendance to sell and search for hard to find car parts and everything else from antiques to rare toys. The NBE Lions booth was put up club members Thursday night and taken down Sunday at the conclusion of the Antique Car Show awards ceremony. The booth sported a simple menu of sausage wraps, breakfast tacos, and Oreos, along with several beverages that included coffee, iced tea, and lemonade. After the conclusion of the event, our club cleared about $1000 profit for the three days event.